(L-R) Current Wright State student Randy Boll and alumni Andy Platt work in an office full of Raiders at Northwestern Mutual. Randy Boll has a history with Northwestern Mutual. When he was 19 years old, Boll was diagnosed with cancer. He would have been uninsurable for the rest of his life if his parents hadn’t already purchased an insurance policy for him from that very company. Now Boll is selling policies to families like his, as Northwestern Mutual’s top intern in the country. Boll is in his senior year at Wright State University, majoring in political science. Boll’s supervisor, Andy Platt, is an alumnus of Wright State’s Raj Soin College of Business. Platt is the college unit director for Northwestern Mutual’s Miami Valley Group and one of the top five college unit directors in the company. He was the one who encouraged Boll to transfer to Wright State. In fact, Boll and Platt’s office is full of Raiders. Many of the interns and full-time staff are either students or alumni of Wright State. Platt said he likes to recruit Wright State students because they are ready to work. Boll is definitely one of those driven students. His daily routine is a whirlwind of activities. Interns like Boll are one of the reasons that the Northwestern Mutual internship program has been in the top 10 internship programs in the country for the last 15 years. It is the only program to have made the list every single year. “Not even NASA has done that,” said Platt. As hard as Boll works in his internship, he said he still loves it. The office environment is perfect. There is a strong sense of camaraderie, and no one would ever think of sending the intern out for sandwiches and coffee. “You’re treated with a lot of respect,” said Boll. Boll likes working for Northwestern Mutual so much he’s planning on staying there. 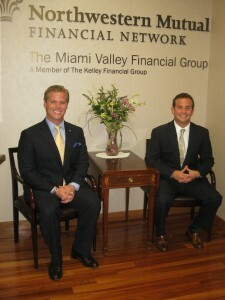 In June, when he graduates from Wright State, Boll will start working full time at the Miami Valley group office. He will be taking over Platt’s work as the new college unit director, facilitating internships for other hardworking students. He’s starting with a long list of clients already under his belt, an advantage of his internship and a product of his hard work. His internship has also inspired passion for the job. “Now I can’t imagine doing anything else for the next 30 years,” he said.